The Horizon Duos Sub Ohm Tank is a powerful subtank version of the SUB RTA from Horizon that comes equipped with an interchangeable colored tank section to give you full control over the style of your vape. This 26mm Sub Ohm Tank from Horizon features a durable stainless steel construction with Pyrex glass tank that can hold up to 5mL of liquid at a time. A convenient top fill method with innovative locking system allows you to achieve the max fill capacity in just of matter of seconds while completing removing the possibility of leakage. Horizon DUOS Sub Ohm Tank comes complete with an adjustable airflow control system with three wide air channels that truly allow you to maximize your vapor output. This sub ohm tank from Horizon Tech comes stocked with two of the Duos sub ohm atomizers, each rated for use within the range of 80-100W, perfect for those looking to create the absolute most vapor possible. If it's even greater clouds you prefer, Horizon's Duo Sub Ohm Tank can be paired with the Smok TFV8 atomizer heads or the optional RTA base (sold separately) for advanced custom coil building. 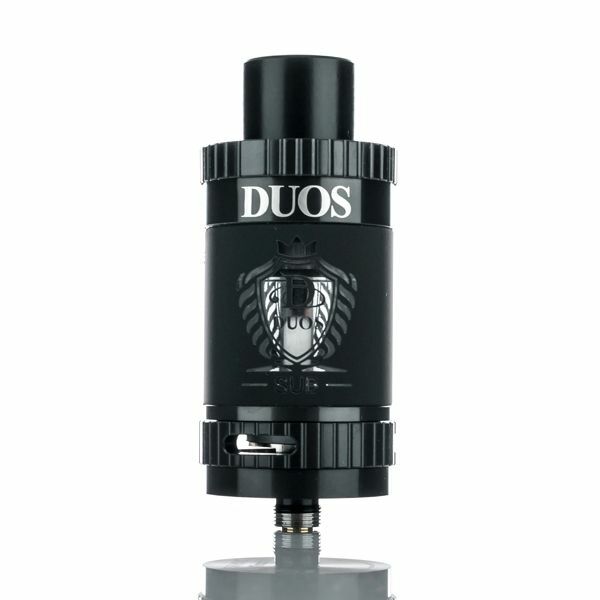 Please note the Duos Tank we currently stock has the Frosted Black Tank with a clear replacement glass tube included in the box.